When opportunity knocked, Michael Zier of the Stray Cat Brew café opened the door. On the other side were Pokémon GO players avid to stock up on Pokeballs and his products. Zier recently found out that his coffee shop in Maywood, NJ is a PokéStop in the popular game which has taken the world by storm. As a Pokéstop, a place where Pokémon players can stock up on supplies, Stray Cat Brew is the perfect place for players to take a few minutes to sit down and enjoy a tasty treat while taking advantage of the free Wi-Fi. “It’s fun” Zier says “it encourages them to stick around and try new products”. Want to increase traffic to your business? You should be considering purchasing Lures on the app and placing them at your business location. Lures increase the rate of Pokémon generation in the area around the PokéStop where they’re placed for one half hour. For a little more than a dollar an hour, you can bring virtually guaranteed crowds to your business. Business giants like Kmart have already started doing this to fuel traffic to their stores. There are also plenty of “low tech” strategies to help you attract players to your business. You can set up “Charging Stations” inside your business where players can charge their smartphones. Another option is offering free bottled water or water refills to thirsty players. Either option will encourage them to step inside your business and take a look at what you have to offer. 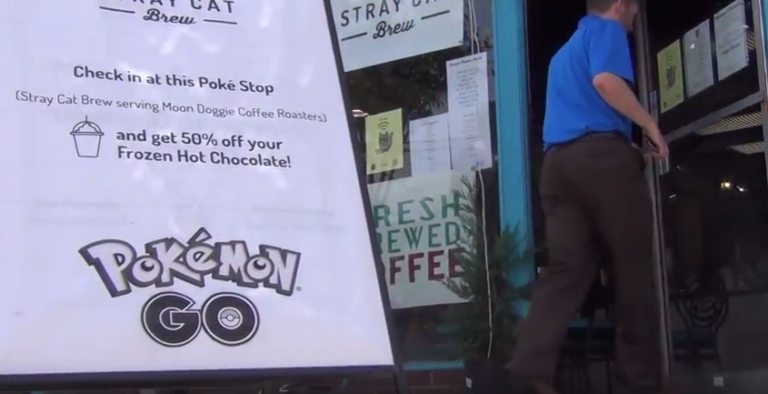 Much in the same way that Stray Cat Brew offers free Wi-Fi and drink specials, you can encourage visiting Pokémon hunters to stay at your business and purchase. Discounts and 2×1 deals are very popular with consumers, especially those playing in groups. Giveaways can also be a powerful motivator for purchase. Get useful products personalized with your company logo. You can give them smartphone accessories like smartphone wallets, styluses or power banks as incentives for their purchase. You can also get t-shirts or buttons in Pokémon team colors and give them out as prizes for players who capture rare Pokémon at your business and share the news on social media. Take in-game screenshots of Pokémon around your location and post them on social-media platforms. Remember to use hashtags like #pokemongo and #pokemon to get the message out to potential new customers. Use deals and promotional giveaways to encourage players who visit your business to check in and share the Pokémon they have caught there with their followers. Worried that Pokémon GO is just a fad? Remember that no marketing technique is popular forever so that shouldn’t be an excuse to pass up the business opportunities that this game is generating today. Even if the game is not as popular in six months you will still have driven traffic to your business and had lots of fun.